The latest book in the Law and Christianity series, edited by John Witte Jr. and published by Cambridge University Press, focuses on marriage and clocks in at more than 1,000 pages. Philip L. Reynolds, C.H. Candler Professor of Medieval Christianity and Aquinas Professor of Historical Theology, is the author of, "How Marriage Became One of the Sacraments." 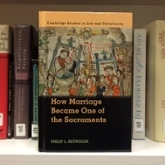 The book traces the concept of marriage as one of the seven sacraments from the medieval church to the Council of Trent, which defined the doctrine as a dogma of faith for the first time but made major changes to it.